Boasting contemporary luxury styling and high-quality personnel, Grand-Bank Link Hotel is located in Ota, the third largest concentration of industries in Nigeria. It is situated at Km 9, Idiroko Road, Ota, Ogun State, Nigeria. Rooms at the hotel are in varying categories. These categories are Standard, Deluxe and Executive Rooms. 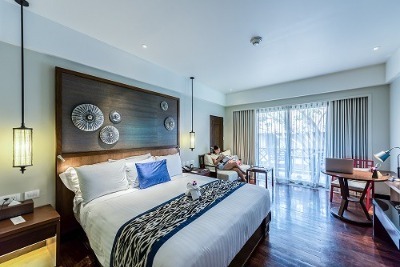 Each room is designated non-smoking areas and its fitted with modern in-room equipment such as air-conditioning, a flat screen TV, a well-polished work table and an en-suite bathroom. Grand-Bank Link Hotel has a couple of facilities, which include: 24 hours electricity, free Wi-Fi, swimming pool, a fitness centre/gym, free ample parking space, a restaurant that serves a variety of delicacies and a bar where guests can order from a list of both alcoholic and non-alcoholic beverages. The on-site restaurant serves breakfast, lunch and dinner at a surcharge. The premises is guarded by security personnel to ensure the safety of guests and their properties. It also has event facilities. Grand-Bank Link Hotels offers additional services to its guests on request including laundry/dry cleaning services, 24 hours room service, ironing and concierge service. Children: Children below 15 are allowed to stay at no extra charge. Q: Does Grand-Bank Link Hotel offer free Wi-Fi? Q: Does Grand-Bank Link Hotel have a swimming pool? Q: Does Grand-Bank Link Hotel offer complimentary breakfast? Q: Is there a fitness centre/gym at Grand-Bank Link Hotel? What type of equipment are available? Q: Does Grand-Bank Link Hotel have a restaurant? A: A restaurant is available at Grand-Bank Link Hotel. Grand-Bank Link Hotels is a budget hotel in Ota, Ogun. The hotel is a good place to be because I enjoyed my stay. The facilities and services at the hotel was great considering the room rates. The power supply was impressive and the environment of the hotel was cool. The room was comfortable and the bed size was great for a sound sleep. My stay was not so good because the bathroom was bad. The water did not runl. It was so bad that the staff had to go outside to fetch water with buckets for me to use. The customer service of the hotel was quite good though. It my first time of visit to the hotel and I was scared at first. But they made me feel really comfortable. Their rooms are neat and colorful and the environment is peaceful and calm. I had a good stay. My stay was not that bad, the hotel is clean and they have friendly staff. They had little issue with their generator but it was resolved and they apologized properly. I think they are a decent establishment and I would recommend them. The one issue I had at your is that there wasn't any internet service, not even a paid one. I had to use my phone as hotspot for my other devices. My thinking was that your hotel will have such basic service. Do improve in this area. Have nice pictures of Grand-Bank Link Hotels?